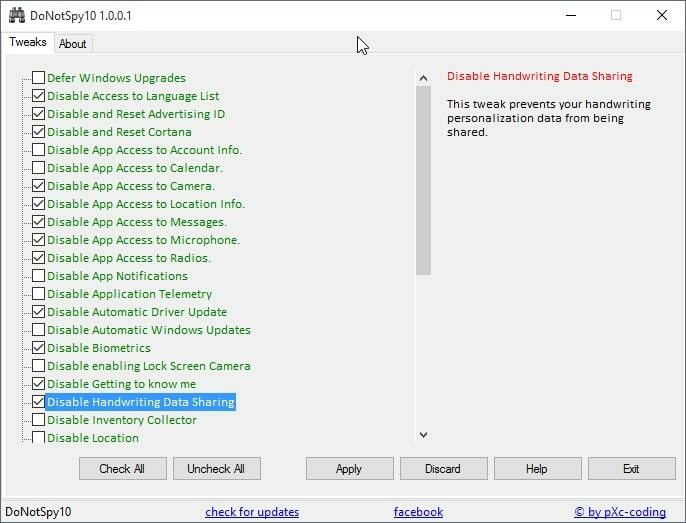 Comparison of Windows 10 Privacy tools | ComTek Computer Services Inc.
Windows 10 users can modify the operating system's privacy settings manually, for instance by disabling express setup during installation or upgrade, or by exploring the Privacy section of the new Settings application. While it gives them full control over each setting, it requires prior knowledge of these settings and time to make the changes. Privacy tools help users in this regard but may limit the control these users have over what is happening in the background depending on how the tool works. The following comparison provides you with an overview of these privacy tools highlighting the good, the bad and the ugly for each of them. Please note that you need to run all programs with elevated privileges as the majority of tweaks are not applied otherwise. You do that with a right-click on the program executable and the selection of "run as administrator" from the options. 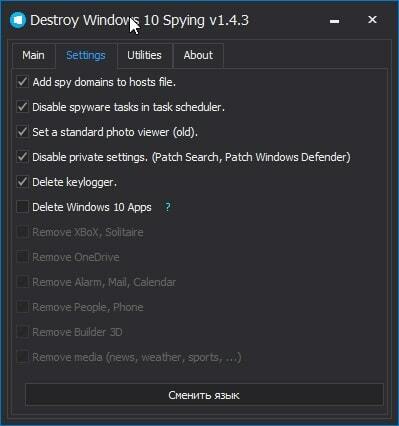 Destroy Windows 10 Spying concentrates on a handful of privacy settings and tweaks only. You may use it to disable spyware tasks in the Task Scheduler, block Microsoft domains in the hosts file, to turn Windows Update on or off, and to remove select applications or all applications from the operating system. The program does not support backup and restore functionality, and there are no explanations for the tweaks it offers. While some are self-explanatory, others reveal nothing about the task that gets carried out when they are run. For instance, you don't know which tasks are disabled in the Task Scheduler when you select the tweak to disable spyware tasks in it. You may run the program from the command line. All switches are explained in the readme file it ships with. This is the smallest tool functionality-wise but the one that is the largest in size. It displays four options in its interface which all concentrate on disabling tracking. 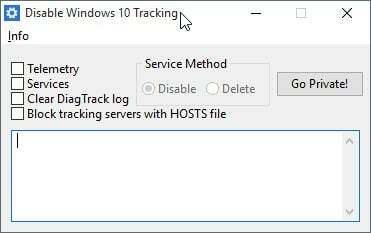 Disable Windows 10 Tracking lacks a backup option and explanations of entries. Note: The program ships with Open Candy adware offers which are displayed during installation. Make sure you block those if you are not interested in those offers. You may create a system restore point on start of the program so that you can restore it should the need arise to do so. The program displays all tweaks as checkboxes in its interface. A detailed description is provided on the right once you select a tweak from the list so that you know what it does and what impact it has on system operations. You find the usual assortment of tweaks supported by DoNotSpy 10. This includes disabling application access to sensors or system features, disabling Cortana or handwriting data sharing. This is a batch file that you need to download from Pastebin. Create a new .bat file on your system and paste the contents of it into the newly created file. 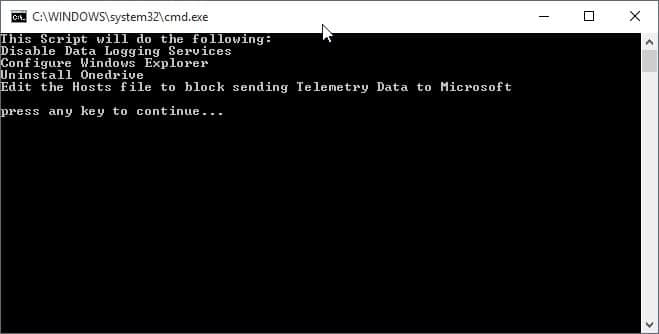 When you run it afterwards, it will execute select privacy related tasks including disabling data logging services, uninstalling OneDrive and adding domains to the hosts file to block Telemetry data sending. The program ships with a compact interface to modify important privacy settings on Windows 10. You do need to click on check first to retrieve information about tweaks that are already set, but even if you do, some settings are listed as unchecked even though they are checked. 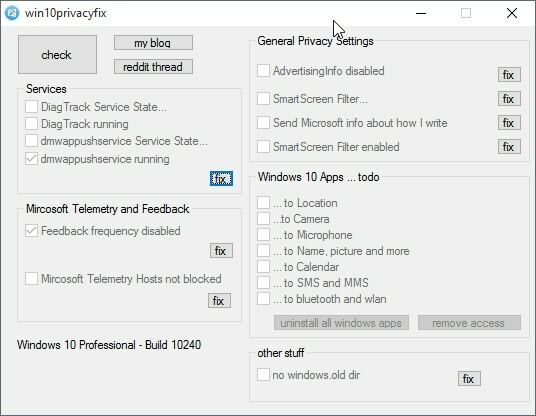 Windows 10 Privacy Fixer lets you disable four core services related to telemetry and feedback, block Telemetry hosts, disable application access to system features such as location or calendar, and make general privacy changes, for instance by disabling the unique advertising ID. You may use it furthermore to uninstall all Windows apps. A backup is not created and there is no restore option available as well because of it. Lastly, there are no explanations provided for features. While most are self-explanatory, additional information about some tweaks are necessary to make sense of them or reveal what they actually do when run. The program is only available with a German interface which makes it unusable for most Windows 10 users. The application displays privacy settings and general tweaks in its interface on launch. 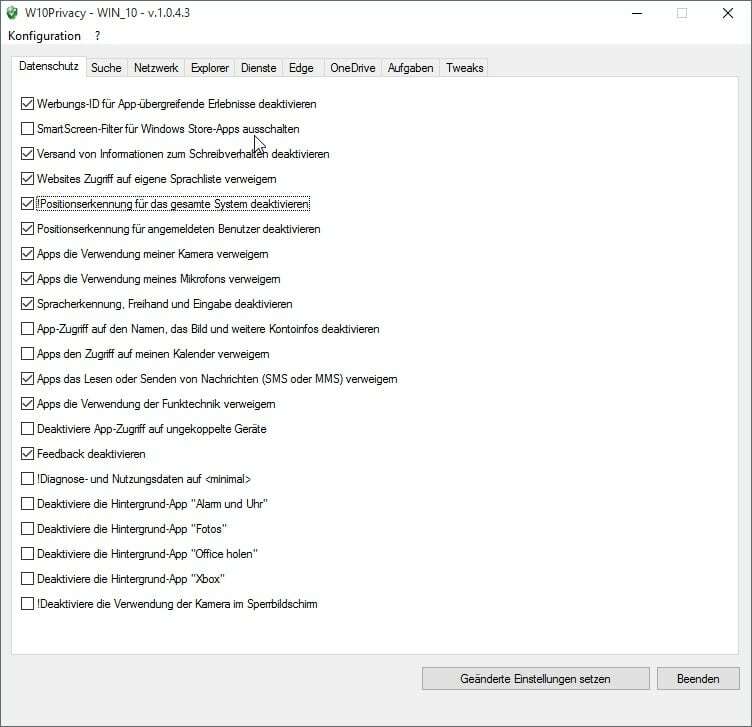 The first tab, Datenschutz (German word for privacy), lists privacy-related tweaks you can make. The tweaks are mostly self-explanatory but when you hover over an entry additional information about it and its impact are revealed by the app. W10 Privacy offers no backup and restore functionality. This means that you need to create a System Restore point or other type of backup manually before you use it to modify system settings. What you can do however is save the program's own configuration. If you do that you may load them again at a later point in time. All tools discussed in the comparison provide you with options to modify settings of Windows 10 systems to improve privacy. Some offer more tweaks than others, and only one suggests to create a system restore point before making any changes to the underlying system. It comes down to your personal preference in the end and what you want to achieve. All tools disable most of the phone home functionality of the operating system while others go further and let you uninstall apps or make other tweaks that are not necessarily privacy related.